We submitted our “Bridge House” project to the annual Remodeling Design Awards in the Spring and were thrilled in June, during a particularly challenging work week, to get a voicemail saying we’d been given a Grand Award for the project. Woo-hoo! This was a fun project, and only really possible by having great clients who were receptive to our ideas. Sometimes I feel that working in Victorian houses is restrictive and in this case we came up with some great ways to mix old and new…I wasn’t sure which category to submit to but I chose ‘historically sensitive renovation‘. 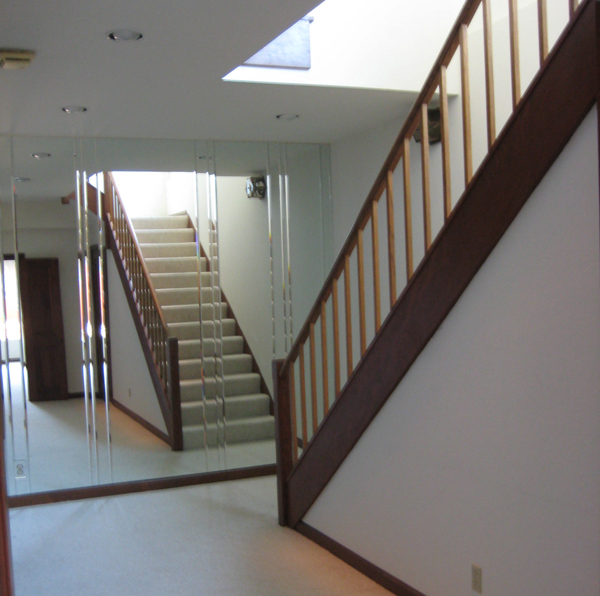 This was the first project for Farooq on our team: he saw it all from climbing up into the dark attic to winning the award. A huge thanks from our team to the judges for this Grand Award!! We’re very proud and excited to share the pages with the other esteemed architects and designers. Thanks to the photographers Eric Rorer and Rachel Styer for capturing the house, and Mixed Nuts for some of the staging elements. Check it out among the other winners here. 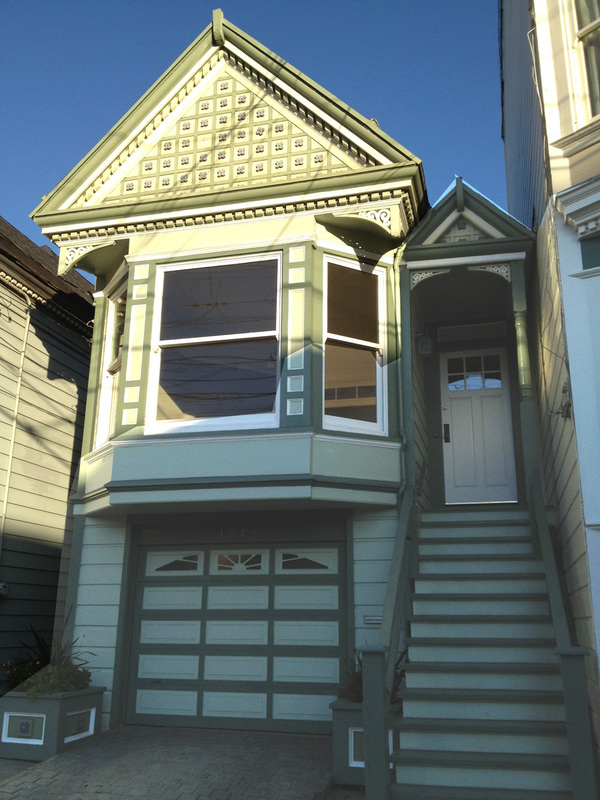 Here is a typical ‘railroad flat’ Victorian house in Noe Valley. 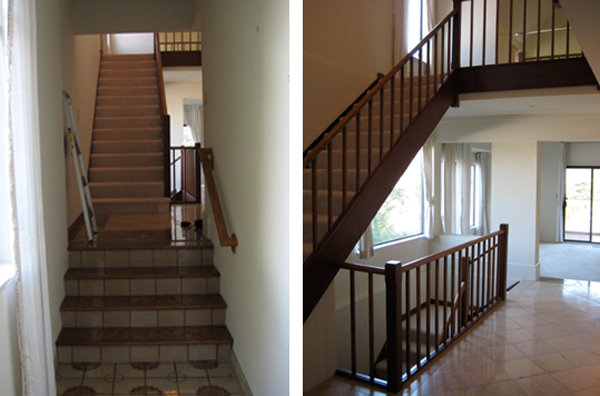 The house is nestled among a tight old neighborhood with close neighbors and a narrow, 20′ wide lot. 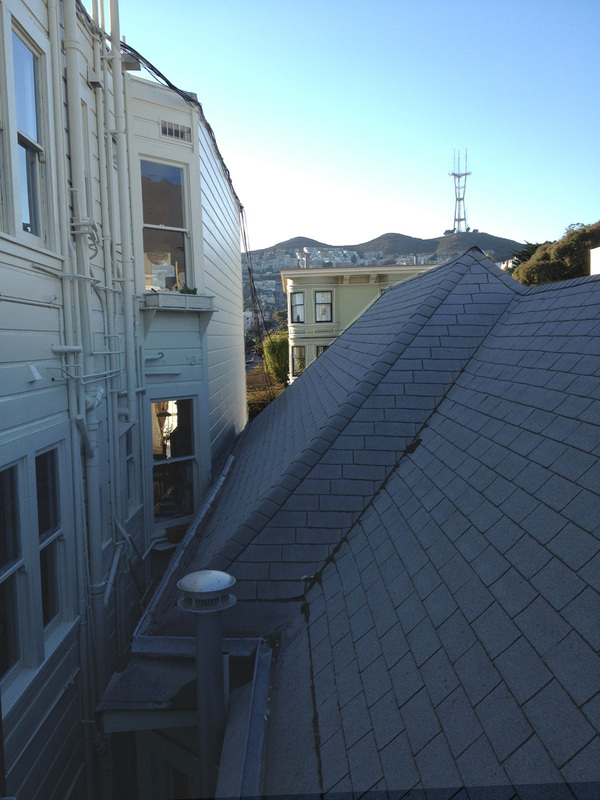 As seen below, the house had a full, unfinished attic – and good views of Twin Peaks and Sutro Tower in the distance. 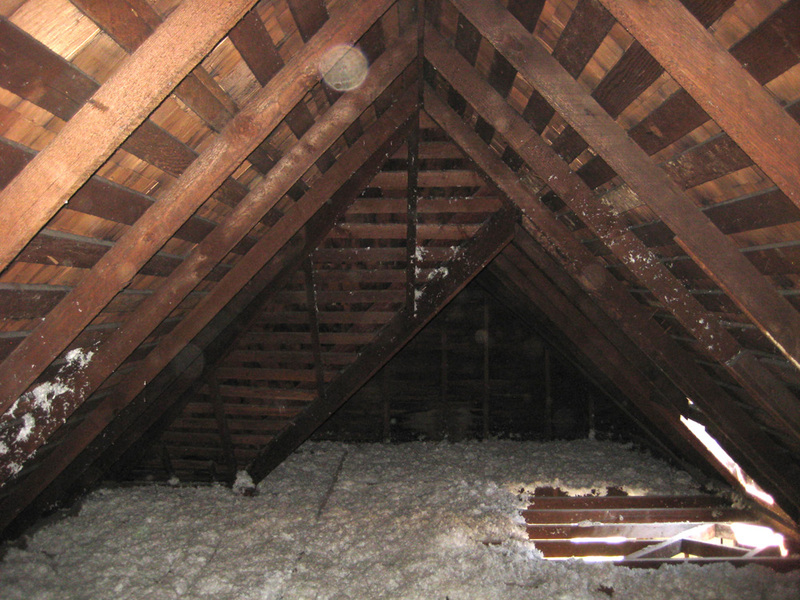 Check out the spooky, dark attic. So much potential. The photo below was taken after the chimney was removed so there is some light coming in, but the first few times we went up it was pitch. Always a gamble what you may find…animals? bodies? box of money? 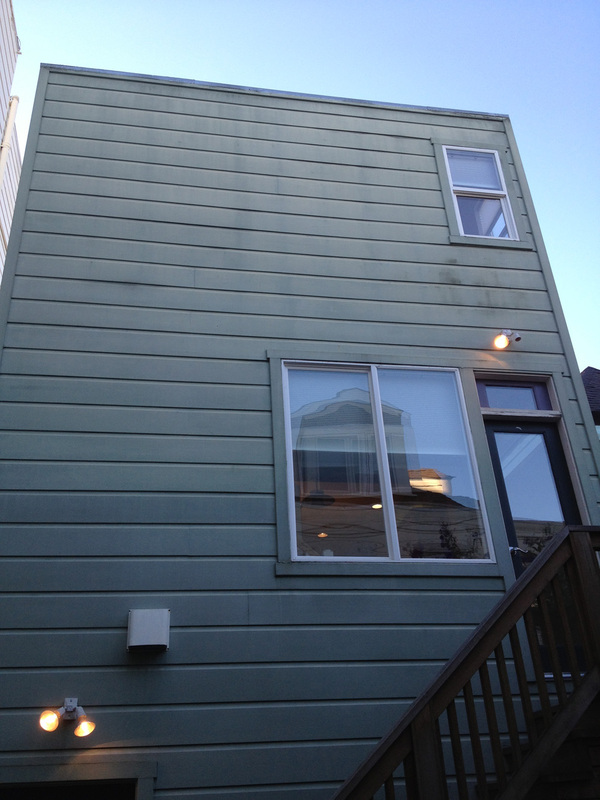 At the back of the house was a tiny flat-roof room addition housing a pink-painted kid’s room. Not many windows in the box, creating a huge blank wall above the rear garden. 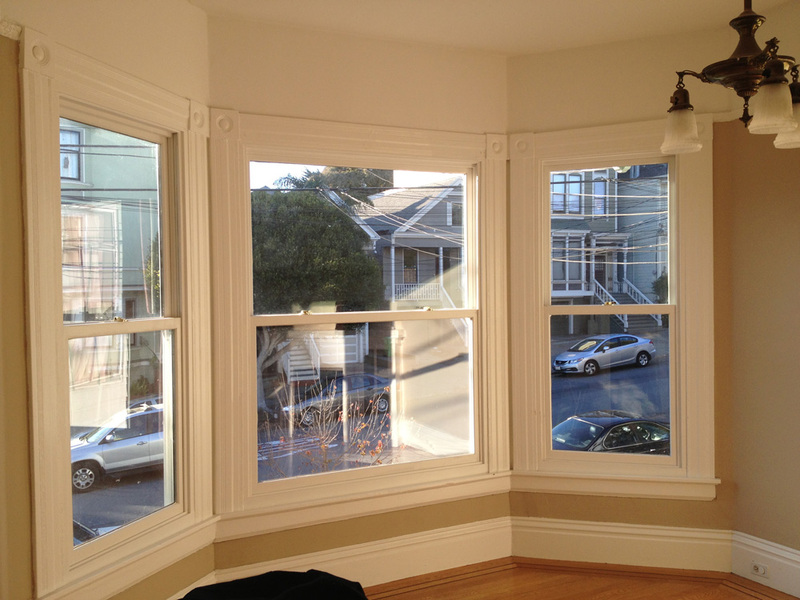 Otherwise the house was in a limbo retaining some Victorian elements and halfway decent updates. That’s possibly the world’s smallest island in the kitchen! Aww. I met the new owners the day after Thanksgiving last year and learned of their quick timeline. 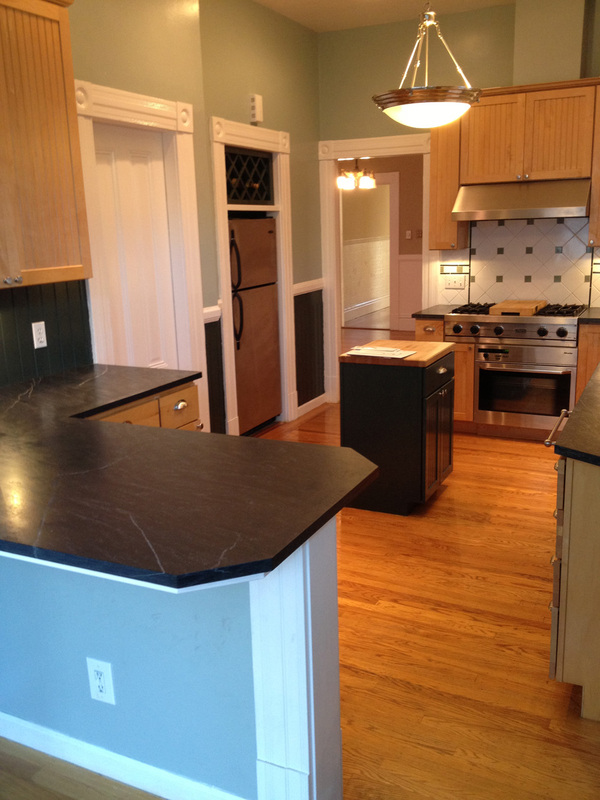 A full, to-the-studs remodel was in order! 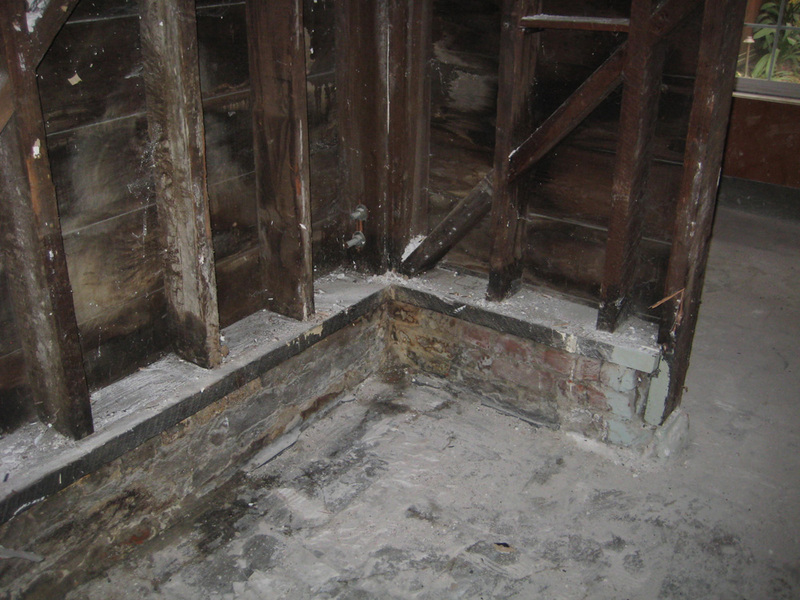 Something else I should point out is the existing brick foundation, on which the house was sitting but was not actually connected to in any way other than gravity! 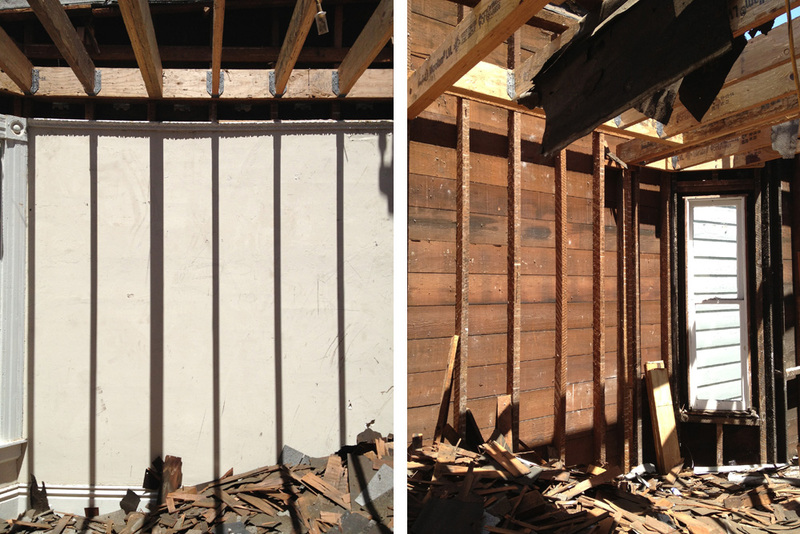 Yes, the house was not bolted to the foundation at all. It could hop right off in a sharp earthquake. In order to create new living spaces at the basement level, we would have to replace the brick with concrete – a huge ticket item, something not immediately visible and would take up a lot of the budget. 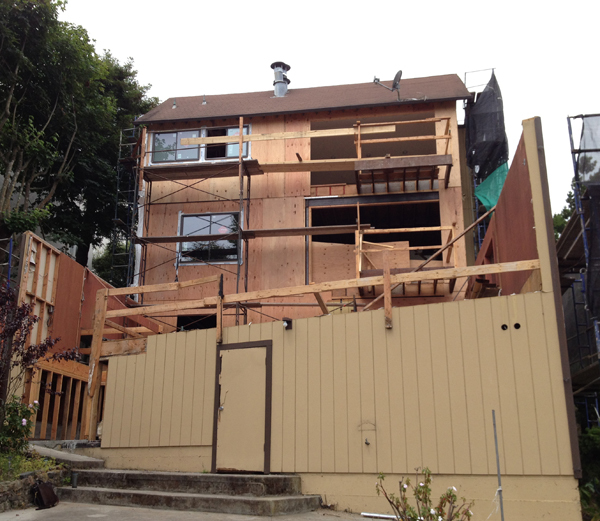 The permit was obtained quickly by avoiding the dreaded, 9-12 month ‘neighborhood notification’ process. 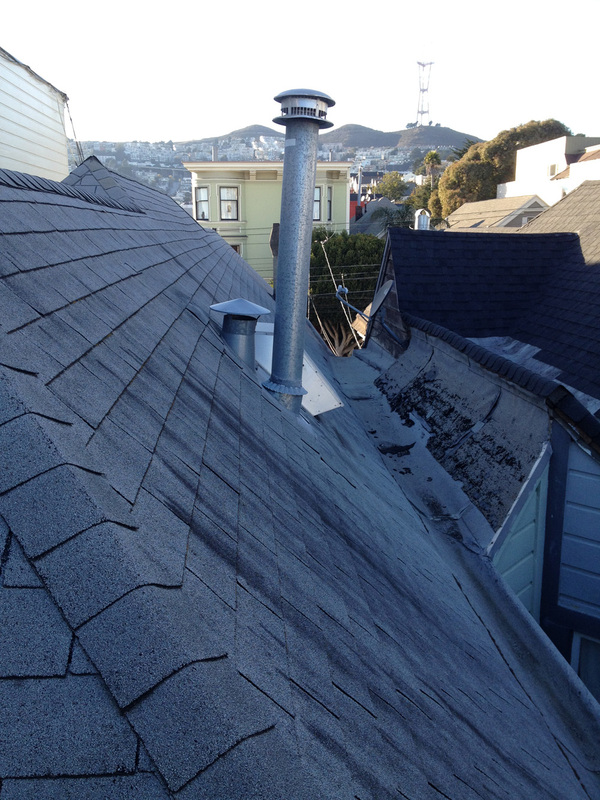 We could add dormers and expand into the attic and basement but no major additions. 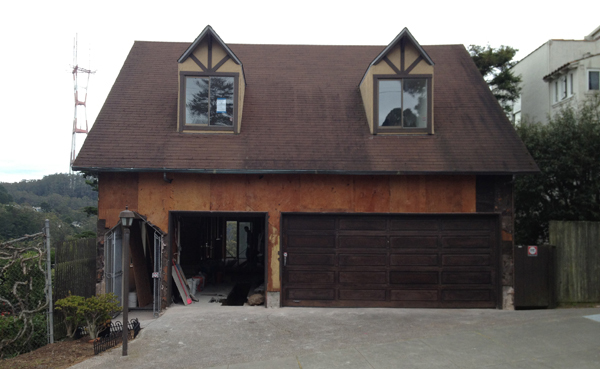 Demo began as soon as we had a permit. The house started to open up. 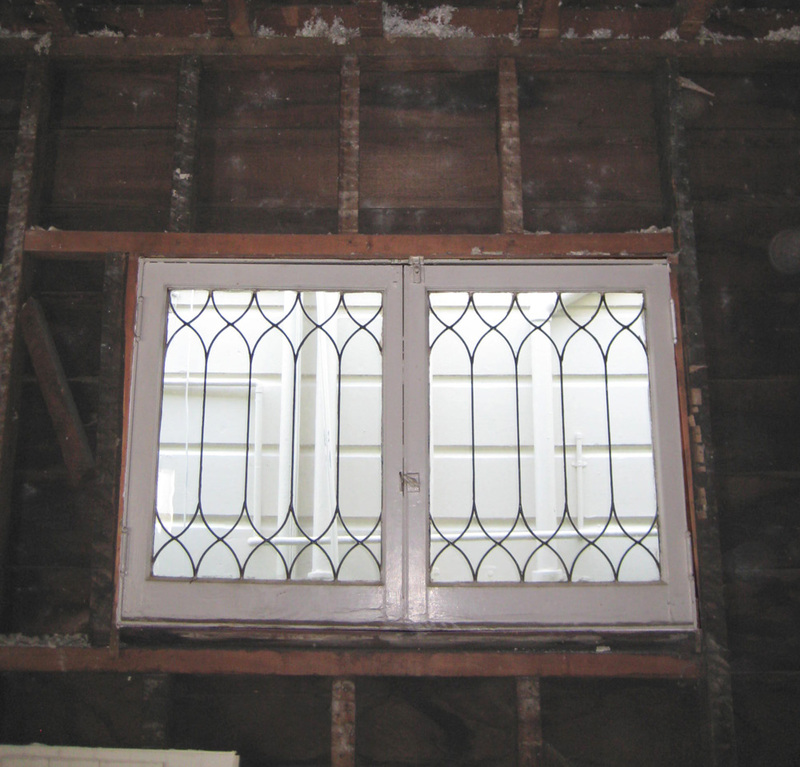 We’ll keep this small leaded window. It’s painted shut but it’s a cute relic. 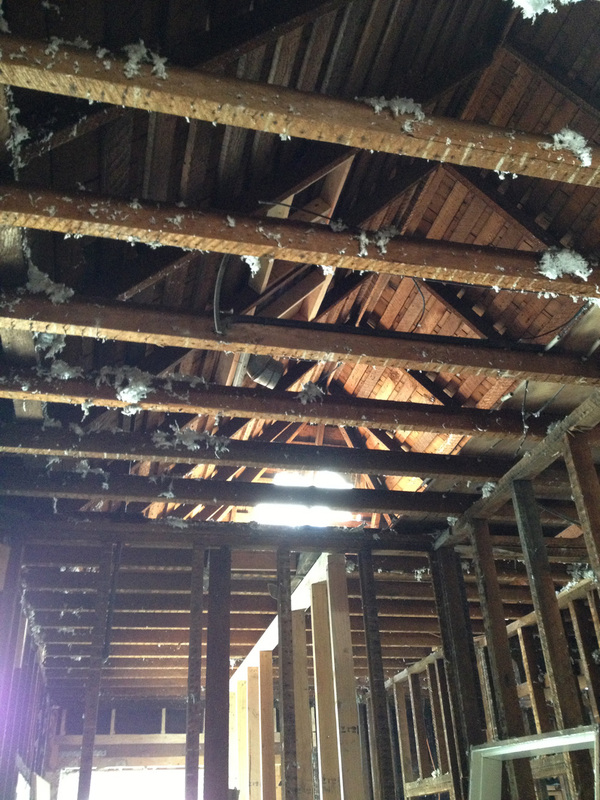 The house feels spacious now with the attic and ceiling opened up. 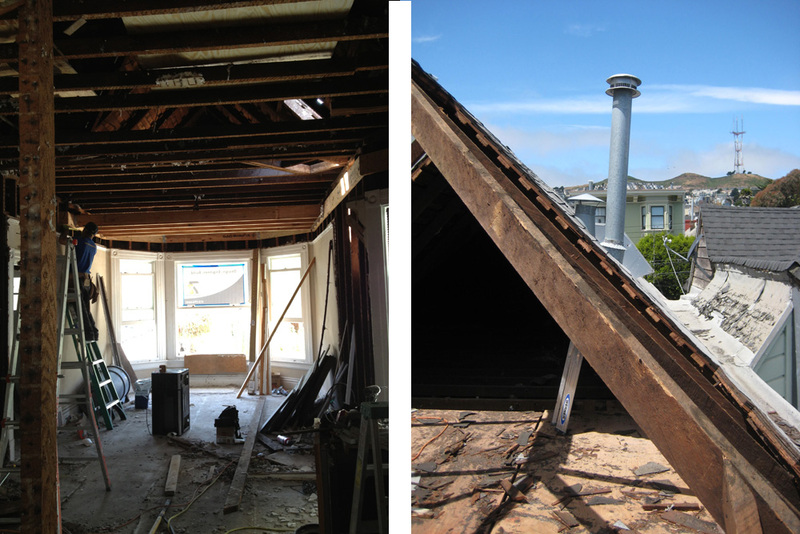 In order to achieve living space within the former attic, we planned to drop the entire ceiling (since we had a generous 10′ height) of the main level. 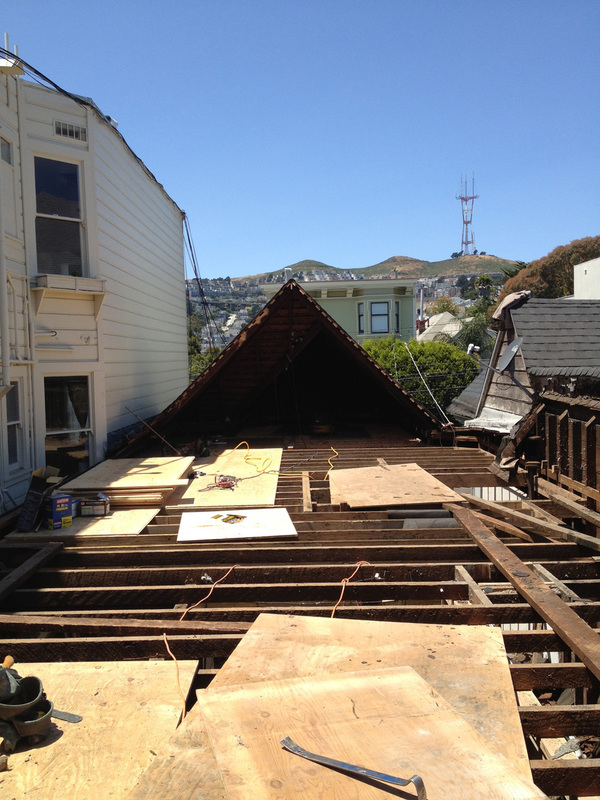 And just like that the roof is GONE! Except for the front 15′ feet. The contractor said the neighbors were looking out their windows wide-eyed. Seems so bright and spacious up here. Initially the owners wanted to create a small deck up there but I encouraged them to actually use the attic footprint for living space – it will be uniquely shaped with the angled roof but worth it. 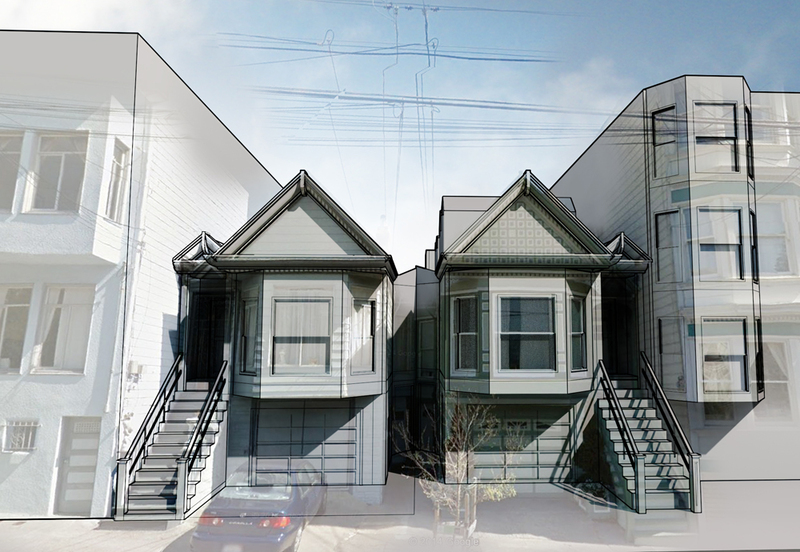 A rendering of the house (on the right with mirror twin on the left) showing the new dormers at the roof level. Stay tuned – more to come! 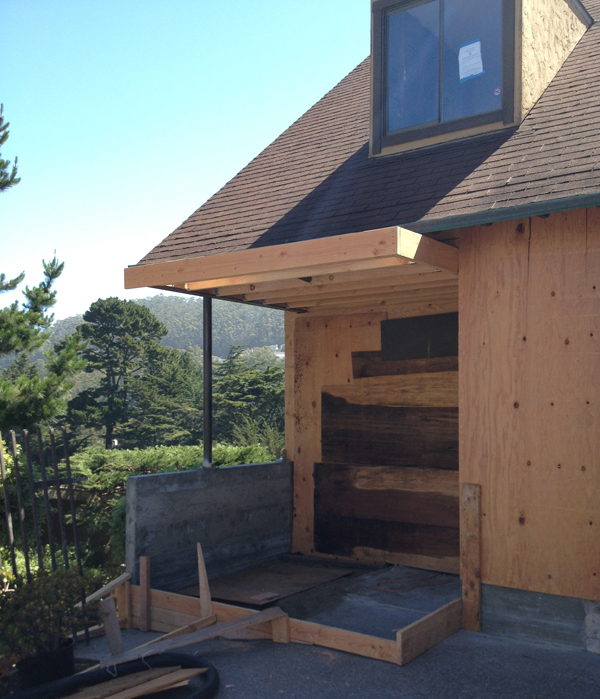 Here’s the new recessed entry with covered stoop and low wall to drop your groceries and dog during the rainy season! 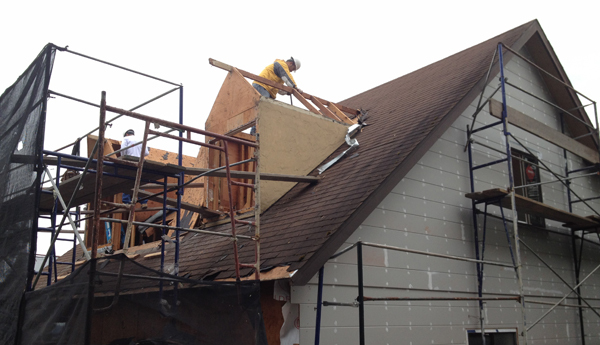 Finally the dormers were lopped off. 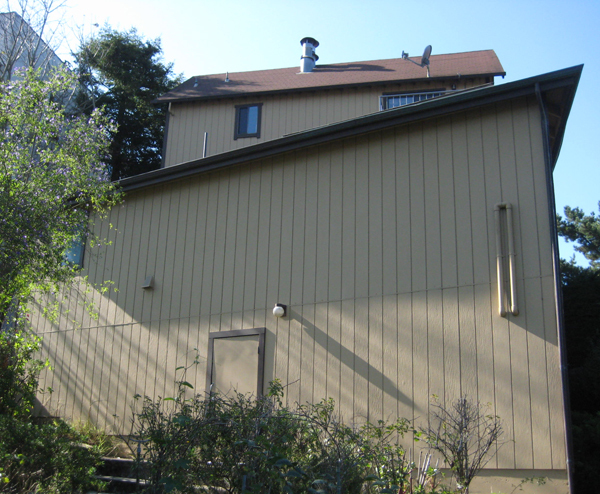 New aluminum windows and new redwood siding up on the sides, over the old T-111 mustard-colored siding. At the back: The walled patio at the rear was mostly removed, for a better rear yard connection. 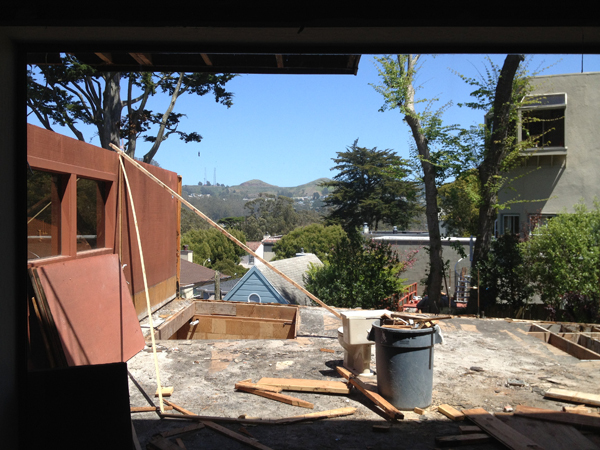 With the walls gone we get a direct view of Twin Peaks! 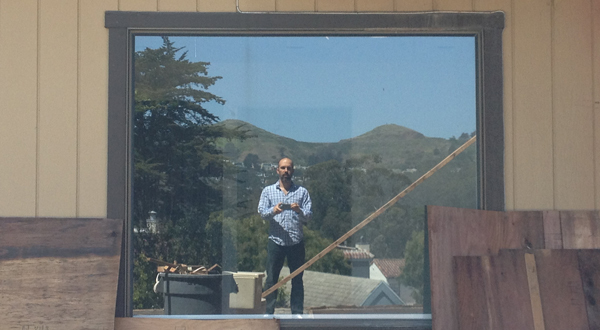 This is me reflecting in the old Family Rm window that was replaced with a 12′ wide opening of doors & windows. 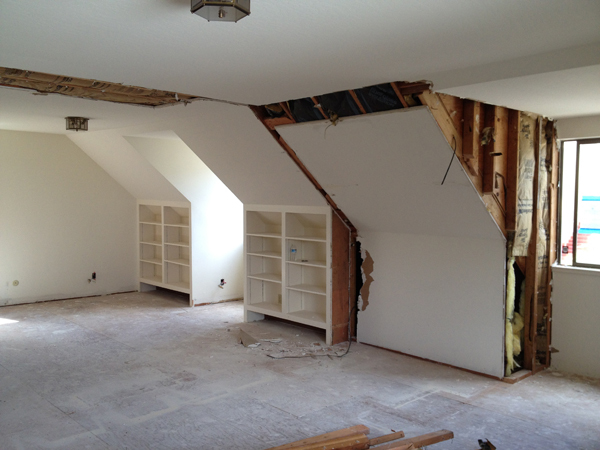 Here are the two front bedrooms with some demo just before small dormers were removed. Stay tuned, more to come!